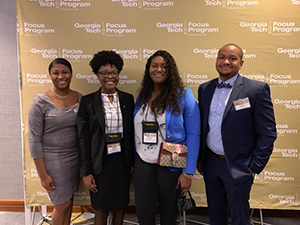 Two students from Fayetteville State University’s (FSU) Department of Biological Sciences were selected to attend the 29th Annual Focus Program at Georgia Institute of Technology (Georgia Tech) in Atlanta, Georgia from January 17-20, 2019. The Focus Program is one of the nation's premier programs for raising awareness of graduate education. It is designed to attract the best and brightest underrepresented minority students and encourage them to pursue graduate degrees at Georgia Tech. The Focus Program invites third- and fourth-year students to apply to attend this program, which is open to students around the nation. Accommodations, meals, and transportation subsidies are provided for all accepted scholars. Badiah Hannon, a graduating senior majoring in forensic science with a biology concentration, and Clivette Williams, a senior majoring in biology, were selected among hundreds of applicants to attend the program. During Focus weekend, the students were able to visit academic units and research laboratories according to their interest, interact with faculty and current students in various departments, meet with the Graduate Admission Office to discuss admission timelines, expectations and funding sources as well as hear testimonials from current graduate students and alumni on life at Georgia Tech and professional careers. Currently, Hannon is a research student in the laboratory of Dr. Shirley Chao, investigating the effects of a Hemp-based pesticide on the Plodia interpunctella or the Indian Meal mothand measuring the mortality rate on the larvae stage of the insect. "I already knew that I wanted to go to graduate school but attending the Focus Program at The Georgia Institute of Technology helped solidify my plans. I received very useful information on the graduate programs at Georgia Tech as well as graduate school in general. All of the information has helped me plan for my future. This experience was once in a lifetime and I am very appreciative of the opportunity," said Hannon. Williams is currently a research student in the laboratory of Dr. Justin Graham investigating 'Pyocyanin Regulation in the bacterium, Pseudomonas aeruginosa'. "Within hours of being in attendance of GA Tech's Focus Program I was able to meet students and faculty just like me from all seven continents all with a passion to change the world in a positive way. This program is one of kind made for the ambitious, intuitive, and passionate. Definitely worth every minute," said Williams. Both Hannon and Williams are currently submitting applications to graduate schools to pursue a graduate degree in a biomedical science field of study. Two Department of biological sciences faculty, Dr. Danielle Graham, an Assistant Professor of Microbiology and Immunology, and Dr. Justin Graham, an adjunct Assistant Professor of Biotechnology and Molecular Biology, were invited by the Focus program planning committee to participate in the events and strengthen the pipeline between Fayetteville State University and Georgia Tech to increase diversity in STEM.